At Citrix's annual Synergy conference in May 2011, the company introduced its "personal cloud" concept to replace traditional desktop computing and cater for IT departments supporting multiple devices, delivering on-demand applications and desktops, as well as protecting corporate data. The thin-client specialist is now making inroads into the cloud. Citrix Systems CEO Mark Templeton says the company's personal cloud concept envisages users being able to collaborate and communicate without geographical or corporate boundaries. "The focus is not on a device called the PC. In this era there is a focus on three PCs - personal, private and public cloud - to provide the kind of work and lifestyles digital native users expect," he says. Templeton says Citrix is also currently investing in its new Olympus project to "productise the cloud stack" and bridge public and private clouds. He believes cloud technology will change the role of the IT department and how employees communicate to make management of devices and employee collaboration a lot easier. Citrix has developed Cloud Gateway, which provides a front-end management portal for software-as-a-service (SaaS) applications. It uses Citrix Receiver to allow employees to access a variety of on and off-premise applications. "We are excited about the Cloud Gateway technology to illustrate and enable the role of IT as aggregator and service provider of information services rather than just operator," says Templeton. While Citrix's desktop applications business makes up around 60% of the business overall, he says the greatest demand from customers is for web collaboration. "We have seen huge demand for greater efficiency and ways of working in terms of collaboration," he says. Citrix Online, which provides web collaboration tools GoToMeeting and GoToManage, is the fastest growing division of Citrix Systems, reporting $360m in turnover in 2010 and $100m turnover in the first quarter of 2011. According to Brett Caine, president of Citrix Online, businesses are increasingly looking for integrated collaboration using web, video and audio for online meetings. "The number one thing we have done that larger companies wanted was integrate HD [high-definition] video," said Caine. Citrix's HDFaces was released in public beta as part of GoToMeeting in June and will be rolled out in the third quarter of 2011. HDFaces uses Citrix's multistream HD technology, which allows online meeting participants to view up to six high-resolution videoconferencing streams in an HD session. Caine says the technology means SMEs can create a direct online video experience without building a telepresence room, which is typically expensive. Currently competing with Cisco WebEx and Microsoft's Live Meeting, Caine is confident Citrix can reach the top spot for web collaboration software among smaller businesses: "We will be the clear number one in SMEs in coming years." However, for large enterprises, Caine admits the company needs to provide more extensive administration tools and make it easier for larger organisations to manage deployment as well as handle Microsoft Active Directory integration. Caine says customers have asked for more support for global languages and a global toll-free service for customers. "Larger and larger companies are attracted to this when travel budgets are cut," he adds. As well as PC-based videoconferencing, Caine says mobility is an additional benefit for Citrix users. Citrix Online plans to provide its service on Apple iPhone and Google Android apps, which are currently in beta, to allow users to join online meetings via mobile devices. A GoToManage iPad app also allows live remote support. He adds that SaaS providers such as Citrix and Salesforce.com have developed mobile apps to extend desktop products, but is sceptical about their long-term practicality. "The fact that you could join a meeting on a mobile device is interesting, but probably not practical. Just because it is possible does not mean it is a good experience," he says. "We need to deliver a great experience for the size of the device, but figure out what's really important for that individual device," he says. Caine believes the emergence of new web standards, such as HTML5, will create new opportunities to improve mobile access to online meetings via web browsers, as well as fuelling a broader IT services movement. "As more HTML5 web apps come online and more robust services are delivered in a web browser, we will see a shift in capabilities and those kinds of technologies will change the way CIOs can deliver cloud services. End-point management tools will give greater controls over what people can and can't do, simply because it is not like having a full client," he says. Unlike the HTML5 platform that still needs to mature, Caine says SaaS-based collaboration tools are viable alternatives to on-premise for both SMEs and large businesses. "To communicate and collaborate with customers it doesn't make sense to do that on-premise, it probably makes sense to use a service," he says. In a report by analyst firm Forrester Research, titled The State of Collaboration: Software Implementations 2011, 46% of businesses said they would be upgrading or planning implementations of collaboration technology in 2011. Almost a third of businesses said they were building videoconferencing suites. 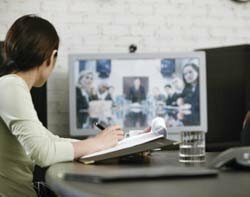 "The growth of room systems, in conjunction with burgeoning desktop video deployments, reflects the emphasis that executives place on video as a means of communicating," said Forrester analyst TJ Keitt. The report shows the greatest benefits for implementing web collaboration tools was reducing travel costs, but the survey also revealed that the majority of businesses (64%) using collaboration tools experience limited additional benefits.